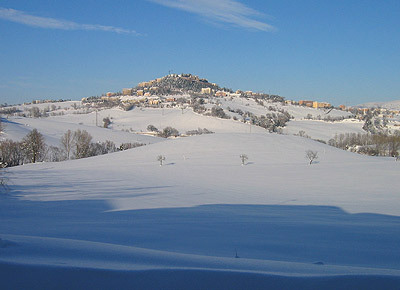 Camerino rises between the Chienti and the Potenza valleys, on the top of a hill that dominates the surrounding areas. Founded by Camerti in preRoman age, Camerino signed an alliance with Rome during the Sannitic wars for the supremacy on Central Italy. On the side of Rome during the second Punic war and the subsequent years, it was conferred to its inhabitants the privilege of the Rroman citizenship (101 b.C.). During the Empire, like for other cities of Italy, Camerino knew a period of peace and development becoming episcopal center in IV sec. a.D.
Besieged by Goths, it then made part of the Byzantin Empire and Longobard Reign. Belonged to the Mainardi counts during the Middle Ages, it passed to Roman Church (1077) paying its faith during the crashs between the Svevian Empire and the Papal State with the destruction in 1256 made by Manfredi's Imperial troops, leaded by Percivalle Doria. After the fall of the Svevian Empire, Camerino was managed by Da Varano family until 1502, when it passed to the Borgia, who got the power until 1545, year in which the city newly passed to the Pope beginning to know a period of slow decline. Camerino is an art casket that surprise for the wealth of its historical center. Starting with the ancient medieval doors that open the town-walls: Porta Malatestiana, Porta Caterina Cibo and Porta Boncompagni. Piazza Cavour concentrates greater monuments of the city: Palazzo Ducale, erected under Giulio Cesar Da Varano ('400), the Renaissance Archiepiscopal Palace ('500) that hosts the Diocesano Museum, and finally the Chatedral, rebuilt in XIX cent. on the previous Romanesque building destroyed during the earthquake of 1799. Other monuments that we only shortly cite here are the Monastero di Santa Chiara, the Borgia's Rocca (1502-1503), the Church of San Domenico, the Church of San Maria in Via. Camerino hosts very year in May the Corsa della Spada (Sword Race), linked to the ancient division of the city and the territory in Terzieri: Muralto, Sossanta and of Means.